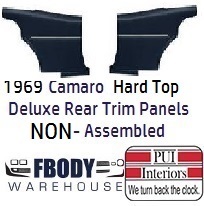 This is a pair of new replacement deluxe rear interior trim panels for use on 1968- 1969 Camaro with DELUXE interior and HARD TOP models only. These are NON Assembled Units. Units do NOT include metal top rail, chrome like accents, or weather seals. 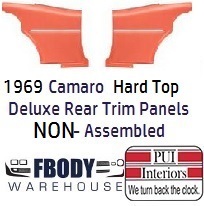 Replacing these units is a snap at home and really improves the look and value of your 1968 - 169 Camaro!